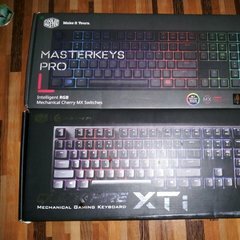 I bought the Masterkeys Lite L RGB keyboard and mouse combo. Keyboard works awesomely, but the mouse lights won't stay on. The lights on the mouse only flash when I change the DPI, but it won't stay on. Thanking y'all in advance. I have been having this exact same problem since a week after I bought it on release. It is incredibly annoying as just like you said, it is clear that the lights fully function ( DPI button lights both up) however when pressing DPI and right click, the lights do not turn on. None of the button combinations turn it on that are shown on the manual/ website. Please can someone respond with a fix, I have tried the mouse on other PC's, same issue. It was working for a few days and then stopped!?? Thanks. Yup. Felt like an idiot doing the button combos with no success. Better sent out a ticket to Cooler Master customer service, They will help both of you to solve yours problem. I GOT IT!!!! FINALLY!! The support didn't help, just told me to return it (as always) which was not an option as I bought it in Bangkok and live in Australia. Anyway, there was another thread on this and the guy said he just waited. Well I have waited 2 months at least with nothing, when randomly, when my PC was turned off, the lights went red. I turned on my PC in hope but the lights turned off. I pressed right click and DPI but nothing happened. Then, in a last shot of desperation I pressed the DPI and the scroll wheel when the lights finally turned on to pulse mode. I then followed the instructions in the manual to change it to static cyan just how I like it. Now, for the red lights to appear I had to plug the mouse into the 'always getting power USB port' on my motherboard, so that when the PC was off the mouse was receiving power but no data. Most laptops and decent desktops have this port. It can usually be identified by a Lightning bolt next to the usb port. Hopefully this helps someone. Mine started working on Thursday. I just spammed the buttons then it did some slow pulse and now I'm able to switch the lights on and off at will and switch between the modes. It's so funny that our mice started working round the same time, having the same problem and my internet has been off for a week now, changing ISP's. So very funny. Anyways, may our nights light up.